The Indian equity market was largely flat in April 2014 as uncertainty over general election results prevailed and corporate earnings failed to inspire market. Recent economic data also fell short of expectation adding to market worry. Market saw profit booking as market participants became cautious ahead of May 16 (day of the general election result). Small cap and Pharma stocks were stars of the month as they were the top gainers with 6.5% and 6.2%, respectively. 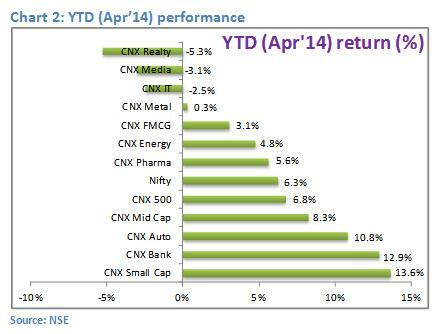 Realty (-5.2%), Media (-3%) and FMCG (-2.8%) were the top underperformers during April 2014. FIIs inflows in the Indian market also dropped considerably during April’14 after a record inflow in Mar’14. 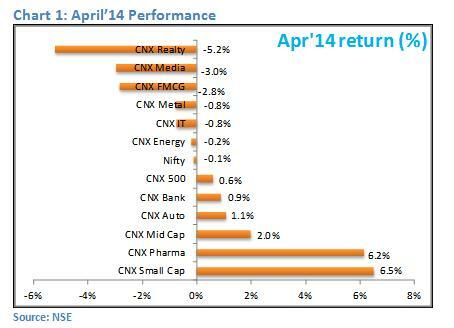 FII investments in Indian equities dropped to Rs.96 billion in Apr’14 as against Rs.194.7 billion in Mar’14. What more? FIIS also withdrew money from Indian debt market during Apr’14 as bond yields started falling from 2nd week of the month. Mutual funds continued to show lack of interest in Indian equities for eighth consecutive month clocking net withdrawals of Rs.29 billion during Apr’14. On positive note, a Times of India report indicated that retail investor’s participation have increased in the equity market in last couple of months. In the international market, spotlight was back on Russia-Ukraine. S&P downgraded Russia to BBB-, one notch above junk, prompting Russian central bank to increase rate to 7.5%. China’s economic growth slowed to 18-month low in Q1 FY14, growing by 7.4% YoY vs. 7.7% growth in the last three months of 2013. Other economic data from China and US was largely mixed. Federal Reserve Chairwoman Janet Yellen recently noted that the central bankers and many economists see a return to full employment and stable prices by the end of 2016; at the moment, the Fed’s favorite measure of inflation is less than 1%, well below the Fed’s annual inflation target of 2%. Inflation is likely to gradually move back towards the central bank’s target. Returning to domestic market, India Meteorological Department’s (IMD) said that India will see below normal monsoon this year due to global weather phenomenon El-Nino. Manufacturing activity remained stagnant in the Apr’14 as PMI stayed put at 51.3 points in April, same as March. Separately, TDSAT quashed Department of Telecommunications’ (DoT) penalty on Bharti Airtel (Bharti), Idea Cellular (Idea) and Vodafone. The tribunal also allowed intra-circle roaming (ICR) for 3G services. DoT had earlier issued notices to operators stating the illegality of providing 3G services through ICR pacts and imposed a penalty of INR500mn per circle. Bharti, Idea and Vodafone had been served penalties of INR3.5bn, INR3.0bn and INR5.5bn, respectively. In banking space, in a bid to inculcate more transparency in banks` credit culture, the RBI has issued a working group`s draft report on pricing of credit. The recommendations intend to address issues on three key parameters: (1) effective transmission of policy rates (proposal to introduce base rate dependent on marginal cost of funds); (2) discriminatory treatment of old borrowers vis-à-vis new borrowers (board approved policy to determine pricing framework); and (3) arbitrary changes in spreads (not allowed expect in case of change in credit profile). The latest quarterly earnings season is off to an encouraging start, with the top IT companies posting strong numbers. A couple of private banks have also reported better-than-expected results. Corporate earnings will continue to trickle in over the next few weeks. Trend in FII flows will be an important factor besides domestic and global events. General election result on May 16 is expected to set direction of the broader market.